November is finally here...and now that the cold weather has returned to Texas, my thoughts once again seem to be focused on food that provides warmth and comfort. Next to Filipino cold weather comfort food like Arroz Caldo, Tinolang Manok or Tahong, Beef or Pork Nilaga, and Fish or Pork Sinigang, Beef Chili has become a household favorite! 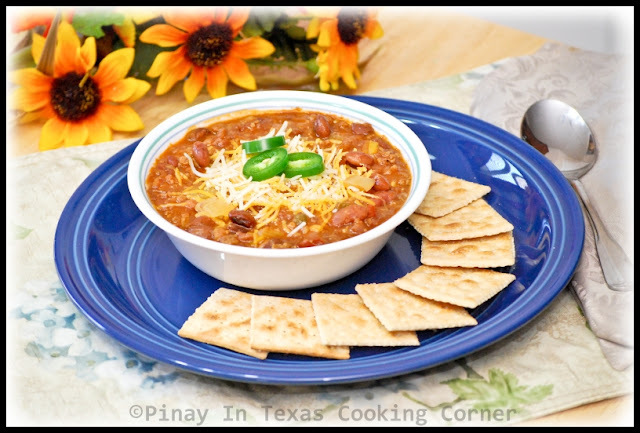 We actually love chili anytime of the year...but we find it so perfect during fall and winter. It's so good and easy to make, and with saltine crackers, it's enough to stand alone as a meal. 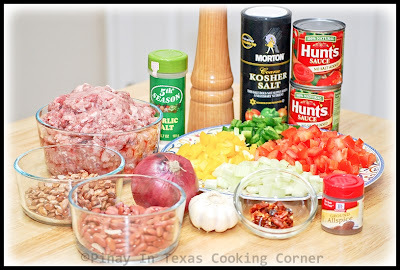 Here's one of my Beef Chili recipes which my family consider to be one of the "best cold weather meals prepared by mommy"! :) I always use home cooked beans for this. Though beans take time to cook, you can leave it unattended for most part, so I still go for it! At least I am sure that there's no sodium and preservatives in it, and they taste better and aren't mushy as the canned ones. 1. After soaking, rinse beans in running water then drain. Put beans in a pot and cover with water about 1 inch above bean level. Bring to a boil over medium heat. While the beans boil, skim off all the scum or brown bubbles that will form on top. 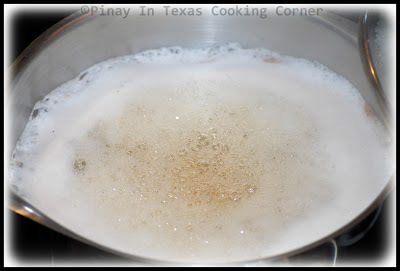 Turn the heat to medium low for a gentle simmer and cover the pot with a lid. Cook until the beans are done. It usually takes 1 1/2 hrs for the kidney beans to cook and 1 hr for the pinto beans. Once the beans are done, remove from heat and drain. Set aside. 2. 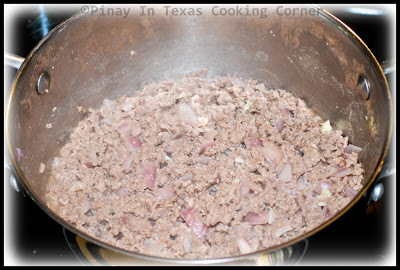 In a large saucepan over medium heat, cook and stir the beef, garlic and onion until the beef is brown and onion is translucent, about 10 minutes. Drain grease from beef. 3. Stir in half of the beans, tomatoes, tomato sauce, Jalapeño, bell pepper, red pepper flakes, all spice, black pepper, and garlic salt. Bring mixture to a slow boil; cover and reduce heat. 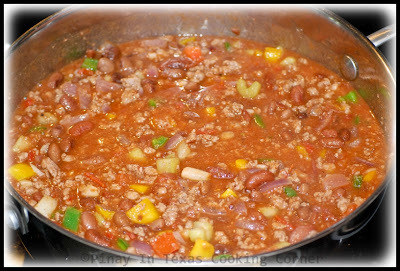 Simmer chili for at least 30 minutes, stirring occasionally so that it does not stick. This chili can be simmered for several hours; the longer you simmer, the flavorful it gets. 4. Add remaining beans. Simmer for another 3 minutes. Remove from heat. Serve hot with saltine crackers and top with cheddar cheese. Note: I didn't add the beans all at once because I don't like it too mushy. 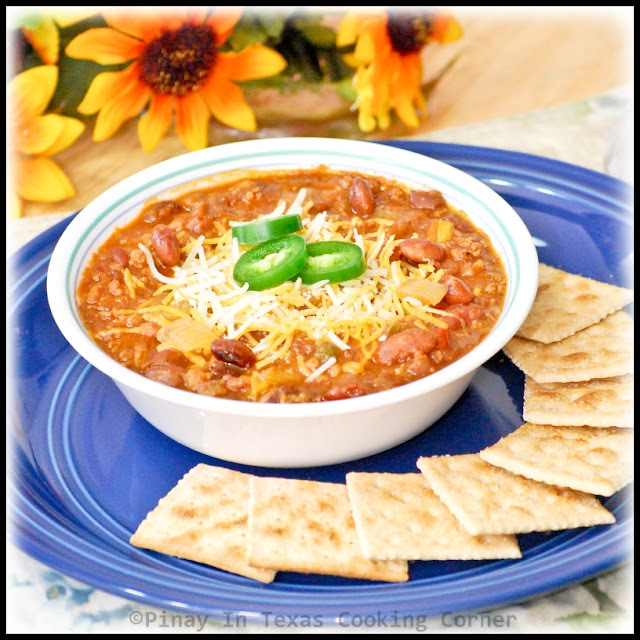 Beef Chili is perfect for this time of year! Love your recipe, and photos are very helpful and "yummy" :) Thanks for sharing, and have amazing Friday! This former Texas girl thinks your chili sounds great. This looks so good! I adore chili! Mmm..We made chili for halloween! This is such a comfort food! Yours looks terrific and I love the thought of allspice! Home-made? Looks like one of those from a 5-star restaurant! Cool!